Join us in celebration as we highlight Wisconsin small businesses through the Small Biz Client Market and Luncheon. This year our luncheon theme: Make an Investment in Impact celebrates the many ways we all can make an impact by investing our time, talent or treasure for our mutual benefit. 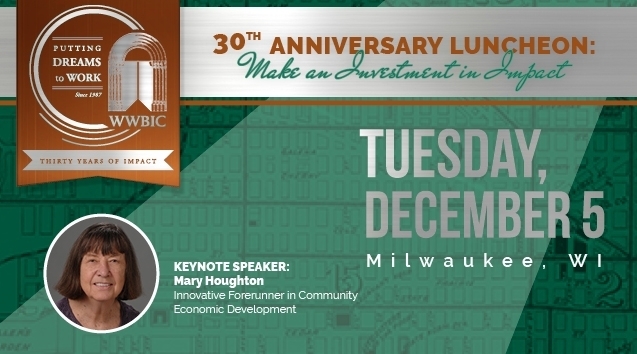 We proudly introduce keynote speaker, Mary Houghton, an innovative forerunner in community economic development. Mary Houghton is an innovative forerunner in community economic development. She co-founded the first community development bank in the United States – Shore Bank, setting the foundation for the Community Reinvestment Act and the CDFI industry. She has remained a strong force over many years. After early leadership in microcredit globally, she is currently working in Canada and India on the boards of leading financial institutions innovating in community investment. Her career focus has served low income communities, women and people of color. She grew up in Milwaukee, is a graduate of Marquette University and Johns Hopkins School of Advanced International Studies and is a true champion for economic health and impact. WWBIC has been making an impact for 30 years supporting entrepreneurs through business education, lending and financial capability programs. Come early or stay late and shop local for your gift giving this holiday season. WWBIC – Over $53.2 million lent – 57,405 individuals served – 9,884 jobs created. You are encouraged to register early as this event typically reaches capacity. Payment can be processed at a later date. Payments via check or credit card (Visa or Mastercard) are accepted. A confirmed registration will generate a receipt/invoice. We thank you for your consideration of an additional donation. Donations provide WWBIC clients complimentary small biz market space and a luncheon seat at a corporate table and support WWBIC’s mission. Table guest names can be entered at a later date. Note: WWBIC Corporate tables include space for 8. All tables are seated for 10 to include individual reservations and WWBIC clients, creating a special networking opportunity at each table. Click below to download a PDF of the summary of a listening session. See what is coming up soon below! Click below to see all of our older news articles!